Gemifloxacin (LG Life Sciences [a spin-off of LG Chemical]/Oscient’s [formerly Genesoft/Genome Therapeutics] Factive) is the newest fluoroquinolone to enter the U.S. market. The oral product was launched in September 2004 for the treatment of mild to moderate acute exacerbations of chronic bronchitis and community-acquired pneumonia (community-acquired pneumonia). An IV form is also in development. The drug was formerly being developed by SmithKline Beecham (now GlaxoSmithKline [GSK]). SmithKline Beecham submitted a new drug application (NDA) in December 1999 for the treatment of bacterial respiratory and urinary tract infections, including community-acquired pneumonia, chronic bronchitis, and acute sinusitis. However, the FDA issued a nonapprovable letter in 2000, citing insufficient safety data about gemifloxacin’s effect on QT interval, liver toxicity, and rash in premenopausal women. Additional studies were conducted to support the application; however, GSK returned commercialization rights to LG Life Sciences in 2002. Subsequently, Genesoft Pharmaceuticals, a small, privately held company, acquired commercialization rights for the product in North America and Europe. In 2004, Genesoft merged with Genome Therapeutics to form Oscient Pharmaceuticals. Gemifloxacin, as a member of the fluoroquinolone class, acts by inhibiting bacterial topoisomerase IV and DNA gyrase. These enzymes are required for DNA replication, transcription, repair, and recombination. In vitro, gemifloxacin has broad-spectrum activity against gram-positive, gram-negative, and atypical pathogens including S. pneumoniae, H. influenzae, Moraxella catarrhalis, Legionella pneumophila, Mycoplasma pneumoniae, and Chlamydia pneumoniae. Studies have shown that the agent has the highest in vitro potency against S. pneumoniae, compared with ciprofloxacin (Schering-Plough’s Cipro, generics), levofloxacin (Johnson & Johnson’s Levaquin), gatifloxacin (Bristol-Myers Squibb’s [BMS’s] Tequin), and moxifloxacin (Bayer’s Avelox), and may be active against strains of S. pneumoniae resistant to these agents. Gemifloxacin has been shown to be highly effective for the treatment of acute exacerbations of chronic bronchitis in several large clinical trials. In a randomized, double-blinded, multicenter study, gemifloxacin (320 mg once daily for five days) was compared with clarithromycin (500 mg twice daily for seven days) in 712 subjects with acute exacerbations of chronic bronchitis. The clinical success rates as well as the bacterial success rates of the two arms were equivalent (85.4% versus 84.6% and 86.7% versus 73.1%, respectively). A subset of patients was followed up for an additional 26 weeks to monitor the frequency of acute exacerbations of chronic bronchitis recurrence. Significantly more patients receiving gemifloxacin than clarithromycin remained free of acute exacerbations of chronic bronchitis recurrences (71.0% versus 58.5%, respectively). In a second randomized, open-label study in adult hospitalized acute exacerbations of chronic bronchitis patients, a 5-day course of gemifloxacin was compared with sequential IV ceftriaxone followed by oral cefuroxime axetil treatment (up to 10 days). In 274 treated patients, the clinical success rates on an intent-to-treat basis at 21-28 days follow up were 82.6% for gemifloxacin compared with 72.1% for the ceftriaxone/cefuroxime arm. Both therapies were well tolerated. The study showed that gemifloxacin-treated patients were discharged from the hospital two days earlier, a statistically shorter length of stay. A third randomized, double-blind clinical trial compared gemifloxacin (320 mg once daily for five days) to amoxicillin/clavulanate (500/125 mg three times daily for seven days) in acute exacerbations of chronic bronchitis patients. Six hundred patients were evaluated. The two arms demonstrated equivalent clinical success rates (93.6% versus 93.2%), and gemifloxacin showed a superior, but not statistically significant, bacterial success rate (90.9% compared with 79.5%, respectively). Both therapies were well tolerated. Finally, a randomized, double-blinded study examined a five-day course of gemifloxacin compared with a seven-day course of levofloxacin. Three hundred and sixty subjects with acute exacerbations of chronic bronchitis were enrolled. The clinical success rate at follow-up at two to three weeks was 85.2% with gemifloxacin and 78.1% with levofloxacin. At long-term follow-up (four to five weeks), the clinical success rates were 83.7% with gemifloxacin and 78.4% with levofloxacin. Safety analysis from clinical studies conducted with gemifloxacin that included almost 7,000 patients treated with the drug indicates that the adverse event rate of the agent is similar to comparator treatment groups. The most common minor treatment-related side effects were diarrhea, rash, and nausea, with the mild rash occurring at a more common frequency than comparator antibiotics (2.8% versus 0.6%, respectively. 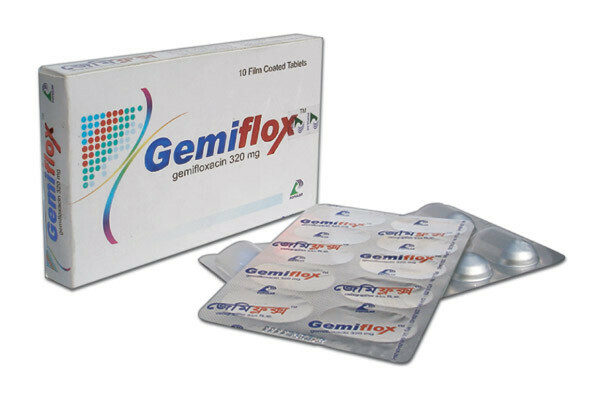 Gemifloxacin may differentiate itself based on its potency (it has one of the highest potencies against respiratory pathogens) and its convenient five-day dosing schedule. However, gemifloxacin would be the third respiratory fluoroquinolone on the market to compete with levofloxacin (following BMS’s gatifloxacin and Bayer’s moxifloxacin), the current market leader. Therefore, it will face significant competition both in differentiating itself to primary care physicians and in gaining favorable formulary status.